After posting my mom on the go outfit I got some requests to show you more of these casual and comfortable outfits, so here is another one. You have seen all of these pieces before (except for the bracelet). My wide leg sailor pants are still the pants I turn to when I want to wear something casual but comfortable. I have no qualms about wearing white even when I go out with my son. These shoes are probably the most comfortable I own and the pants are just long enough for them. Want to see more black and white outfits? You will love my ultimate guide on how to wear black and white. These white pants have definitely been one of my wardrobe work horses, just like I imagine good black pants can be for those of you in a winter climate. I have so many tops that work well with them! As you know I like versatility and clever design and this top is no different. In the top picture you can see it as it is designed to be worn (with both edges of the top buttoned on the shoulders). However you could also just button one corner so the top becomes asymmetric. Want to see another casual outfit? Here is how I wore black and white leggings on holiday. You can also leave it open which turns the tops into a sleeveless cardigan. I acquired the metal bracelet in the middle of the year when I was in Holland. You can wear it with the lock on top of your wrist or below. The lock is magnetic. For more ideas on how to wear wide pants, be sure to visit these tips & ideas for wide pants. What a lovely outfit. 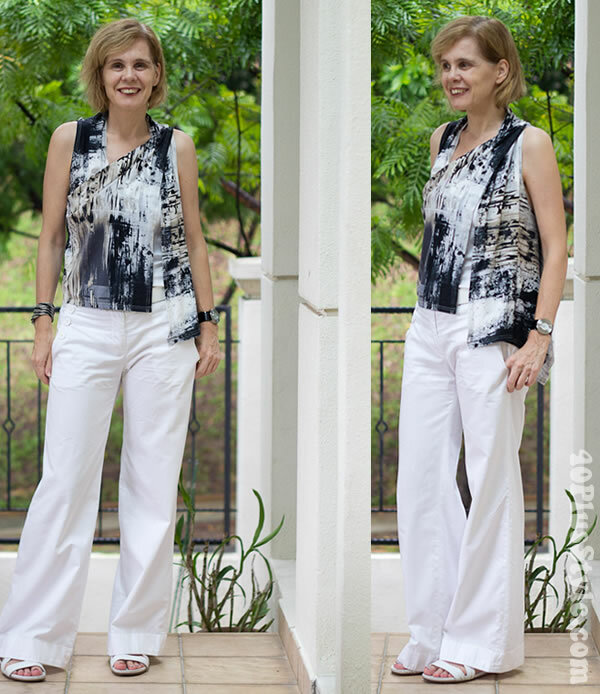 I love white trousers, and I love stylish sleeveless tops. And the versatility of this top…well, I haven’t seen anything like it. Thanks for stepping by Sandra and leaving you first comment. Glad you enjoyed the outfit! Wide legged pants are great with heels, but these ones are now too short (too many washes..) so I can only wear them with flats now. I’m on the lookout for another pair of white straight leg pants that I can wear with heels! (not easy to find in winter time!). It’s my most important basic so I can justify having it in all kinds of configurations and it’s important to have good pants for wearing with heels AND flats. Yes, it just depends on the model of the pants. The other white pants I wore the other day (https://40plusstyle.com/dandy-black-and-white-chic-with-prints-and-colour/) which are tapered would work well with both flats and heels. I always turn to my white pants when I do not know what to wear. I can always find a new combination with it. Enjoy wearing yours! What a lovely simple outfit Sylvia. I always love white trousers on other people, but hate them on myself, not sure why. Maybe I just haven’t found the right ones. Lovely top Sylvia. The whole outfit is simple yet interesting. Being in my cold country, it is strange to see you in these summer clothes. And very tempting. Forgot to say… beautiful bracelet. I know. It must be a bit boring for you. But hopefully you can imagine a little bit or get ideas how you could adapt these outfits to your own climate. In winter this could be winter white and I would add a blazer or cardigan for warmth…. I would wear it with two toned toned oxford shoes in black and white. Merry Christmas Sylvia. I really love that outfit. That top is gorgeous and I am gaga over that bracelet. Love your outfit, I have been a silent reader of your blog for quite sometime, today I wanted to write to tell you that you are doing an awesome job. I am a 33 yr old mom to twins and there are so many blogs that cater to the teeny bopper style and stuff, I can relate to your blog, after a point of time you want to spend time and energy on correct well designed and well styled outfits, not necessarily thrift as you mentioned in one of your posts. Sometimes reading all those blogs where everyone seems to be busy thrifting gives a complex if you are spending full money on something, dont you agree? Sorry for the long comment 🙂 and Oh, Merry Christmas!! Thanks for your feedback Nitya. So good to read that you enjoy the site and that it helps you. I look forward to connecting more with you on the site! You always have the right amount of crisp to your chic- and white looks so classy, and much fresher than black. And yeah, I am wearing copious amounts of black right now to shore up against the cold, but looking at your wonderful graphic black and white outfit is such a treat. I love how you changed up the top- the asymmetry adds an interesting detail and is very Sylvia! Hi Sylvia — this is lovely and a great inspiration to me. I live in southern California and am also a “mom on the go.” I spend more time in informal outfits like this, so I really appreciate seeing this (and would love to see more like it! :-). LOVE the asymmetry of the top, very chic. Thanks for another great post. Tips on how to wear wide legged pants and ideas for flared pants you can buy right now. Previous post: Why we should be proud of our high price purchases too!